Home > Horse Riding Sports > What is Eventing? Eventing is a very popular type of horse sport. It is a major Olympic discipline and one that Brits have had considerable success with in the past. Eventing is derived from the training of cavalry horses in the past, who were needed to be able to perform many different tasks. Because of this, eventing is a good all-round test of the abilities of both horse and rider. It comprises one round each of dressage, showjumping and cross country. 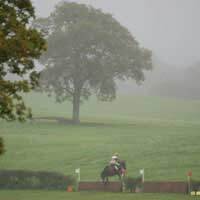 There are two main formats – one day eventing and three day eventing – the latter being where each discipline is held on a separate day and being the type used at the Olympics. The dressage round in an eventing competition is much like a dressage competition in its own right. The arena is the same size as in normal dressage – and increases in length for higher levels of competition. The layout is also the same. The manoeuvres that riders and horses are expected to do increase in difficulty the higher a competitor gets. But there is one difference; an eventing rider is not normally ever expected to be able to perform movements seen in dressage Grand Prixs – the very highest and hardest movements. Each of the movements is scored by judges, both for precision and elegance and the round is a test of the partnership between horse and rider and their control over their movements. The second phase is usually showjumping, of which there is just one round. The jumps used in eventing are substantial although not as high as in the top levels of showjumping itself. The horses which compete in eventing are not expected to be experts at showjumping although they obviously must have a good degree of skill for the discipline. Just like in showjumping there are penalties for hitting and knocking down jumps as well as refusals. There is also a maximum time allowed for the rider to complete the course. Again, like showjumping, the cross country round consists of riders and horses jumping obstacles in a set time. However, the jumps are outside and usually made of natural materials such as logs and tree trunks, or things which are usually found outside like old telegraph poles. There are also jumps made of stone walls – so body protection is music more necessary here than elsewhere, as a fall could be disastrous. The horse will usually also be required to navigate streams and ponds on the course. Being over the set time, stopping or falling all incur penalties. However, there are no extra points for coming in under time so riders generally take their time to improve their chance of jumping a clear round. Eventing is a demanding and challenging sport. There are different levels of competition but men and women usually compete on the same terms. Novice classes refer to the horse and not the rider so if an experienced rider is riding an inexperienced horse they will have to start from the bottom – a curious anomaly specific to eventing, and a good example of the oddities that occur in a sport where man and animals are part of a team.